Just as quirky and comical as its predecessor, Jenny Han’s P.S. I Still Love You is a fantastic sequel to this thrilling and adorable YA romance trilogy. No longer playing pretend, Lara Jean’s experiencing for the first time what it truly means to be in a real relationship. But what happens when you can’t fully trust someone you love? What does it mean when you start to have feelings for more than one person? Wonderfully written and hard to put down, P.S. I Still Love You beautifully and accurately illustrates what it’s like to be young, in love, and searching for ones place in the world during those essential high school years. Since the first book in this series was such a fun read, I figured I would give the sequel a go. P.S. I Still Love You was an enjoyable read that kept me entertained for the most part. Though the sequel had more depth to it and the addition of some new characters really intrigued me, I found P.S. I Still Love You much less enjoyable than its predecessor. The BIG issue I had with the first novel is the lack of depth, glancing over real and serious issues that could’ve added more to the story. However, P.S. I Still Love You reintroduces these struggles, diving further into the emotional traumas and turmoils that surround the characters. The biggest moment for me was Lara Jean’s realization of the moments she wishes she had her mother; while the first book mentions this in passing, this novel really highlights on Lara Jean’s sadness and desire for her mom, a real sorrow that unfortunately many people can relate to. There are other characters who have their own struggles as well, making them more relatable. However, Han makes sure to never stray from the focal point of the novel: young love. Their contribution to the story development creates character growth for not only Lara Jean, but also for her father and Peter and many more. I especially enjoyed the residence at Belleview retirement home, Lara Jean’s part time job. Their outlook on enjoying life to the fullest and living with no regrets really brought out a special something for me. The wonderful thing about Han’s novels is the particular attention to familial love. The Song family have such a strong yet still realistic family connection, drawing in on the authenticity and beauty of it all. Kitty and Lara Jean’s bickering yet still protection for one another is just absolutely adorable. The age gap really adds to the story too, since Lara Jean comments on how she wishes Kitty would stay young forever; the innocence and naive nature Kitty has in comparison to Lara Jean really demonstrates the difference in what we perceive as important or as issues depending on our age, adding that extra depth to the story. Their father is also such a sweetheart – he isn’t perfect, but he tries his hardest to be both a mother and a father to his girls. My girl Lara Jean’s growing up! Her character growth was intense but miraculous in this novel; being in her first ever relationship, she learns the ups and downs of dating. Her views on love go from fiction to more realistic ideals, keeping that same Lara Jean we all love but with a touch of maturity. She does struggle with trust issues and with her own feelings towards more than one person, but Han addressed this is a rather mature manner. Lara Jean discovers that it’s normal to have multiple crushes and to question things in relationships – the most important element is Lara Jean learns from her mistakes and changes for the better and for herself throughout the story. As with the first novel, there are definitely some slow parts yet again. Rather than at the beginning of the novel, these slow parts appear randomly throughout the story. Some chapters had so much going on I couldn’t put it down…other chapters dragged on so much that I would leave the book alone for a day or two. The pacing is better than the first, but there’s still room for growth. Okay…so we have Peter, this rude and rather childish teen who hurts Lara Jean so much that I feel he’s very undeserving of her. Then…we have John, the biggest sweetheart and most understanding guy who treats her like gold. For once…just once, I want a novel where the character picks the healthier and more stable guy, not the bad boy who says he’ll change and she falls for it. Maybe Peter will, who am I to judge? But I just didn’t like how he wouldn’t change until near the end and she still went back to him, whereas John’s already this beautifully kind soul who seemed to fit her perfectly. I think I’m more upset because I could TOTALLY see myself doing this…but I still dislike Han’s decision to have Peter and Lara Jean together. As I mentioned before, Lara Jean grows immensely in this novel. HOWEVER, I felt as though almost every other character doesn’t grow whatsoever! There’s maybe one or two other characters who have some great character develoment, but the overall vibe felt as though Lara Jean was the only one to mature. Oh yes, I’m about to pick on Peter Kavinsky once again. Honestly, I was so fed up with him. Yes, Lara Jean may have some confidence and trust issues, but there’s obviously a reason why. Peter’s so blinded by Gen, I grew really sick of it. Once I learned Gen’s story, I felt sorry for her a tad. Nevertheless, Peter knew she was and continued to be a bully towards Lara Jean and yet he still defended her…no wonder Lara Jean was upset. Peter didn’t really change for Lara Jean until he basically knew she wasn’t going to wait around for him; his personality really irks me; as he was in the first novel, he remains to be rude and childish. P.S. 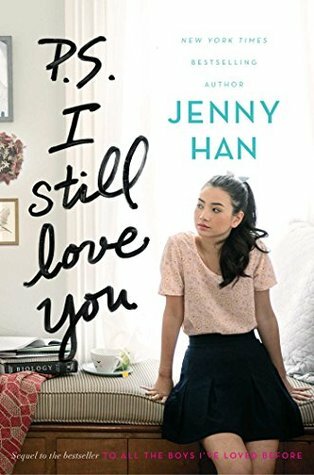 I Still Love You adds much more to the story of Lara Jean’s high school days, as she learns to love and discovers where she fits in this ever-growing world. Though some of the relationships seemed “unhealthy” and the pacing was off a tad, Lara Jean’s hilarious shenanigans and Han’s ability to accurately portray the beauty of young love still sold it for me. If you enjoyed To All the Boys I’ve Loved Before, you’re in for a treat with the sequel! Awe thanks! I worked with someone on Etsy to help me with it and I’m so happy with how they turned out! Lara Jean is super adorable haha! I did see it. I have mixed feelings…we shall discuss after you’ve watched it!